Don't Mess With Texas... Textbooks! 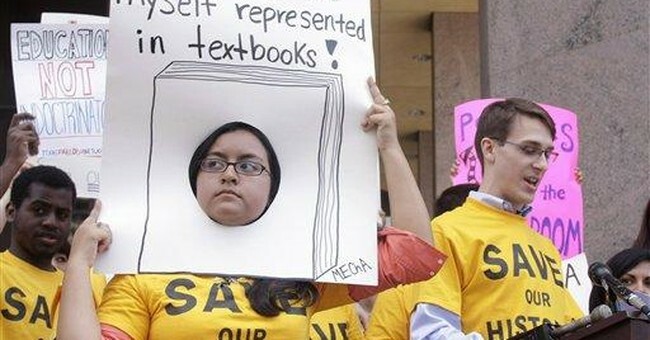 By now, you most likely know that Texas has become ground zero for the latest battles in the textbook wars. While conservatives and progressives take their stands on the issue, I wonder: What would America's Founders think about this feud? For those who somehow have dodged the news, the 15-member Texas State Board of Education, which is composed of 10 Republicans and five Democrats, has been hearing and debating variances of opinion regarding what to include and exclude in its social studies curriculum and subsequent textbooks. Last Friday, the SBOE members began to wrap up the process by endorsing a draft proposal of the state's social studies curriculum, with an 11-4 vote. Not surprising is the full range of progressive issues that liberals want the SBOE to include, from emphasizing equity and tolerance for all minorities to erasing key conservative figures and events from history and whitewashing the Judeo-Christian convictions of our Founders. Liberals and progressives complain that conservatives are hijacking the curriculum process and modifying textbooks to fit their ideological whims. But the history of textbook alterations clearly has proved it is the liberals who have changed the course and content of curricula and textbook production. Conservatives have been largely the guardians or preservationists of tradition. Progressives have changed curricula content to pacify the politically correct and adopt what they value today and want others to value tomorrow. Interestingly, in 2009, authors Gary Tobin and Dennis Ybarra of the Institute for Jewish & Community Research found some 500 imperfections and distortions concerning religion in 28 of the most widely used social studies and history textbooks in the United States. The fact is that the majority of the SBOE's members find themselves in good company, in line and legacy with America's Founders. Their educational philosophy even included teaching on the Bible. As Benjamin Rush, a signer of the Declaration of Independence, wrote: "Let the children who are sent to those schools be taught to read and write and above all, let both sexes be carefully instructed in the principles and obligations of the Christian religion. This is the most essential part of education." Noah Webster, the "Father of American Scholarship and Education," stated, "In my view, the Christian religion is the most important and one of the first things in which all children, under a free government, ought to be instructed. ... No truth is more evident to my mind than that the Christian religion must be the basis of any government intended to secure the rights and privileges of a free people." In 1789, during the same time when the First Amendment was written, then-President George Washington signed into law the Northwest Ordinance, which states, "Religion, morality, and knowledge, being necessary to good government and the happiness of mankind, schools and the means of education shall forever be encouraged." Does anyone not know what the term "forever" means? Can any member of the SBOE or any other state board of education be penalized for agreeing with America's Founding Fathers? Maintaining balanced curricula in our public schools is the reason my wife, Gena, and I joined the board of the National Council on Bible Curriculum in Public Schools, whose state-certified Bible course (elective) has been implemented in 532 public school districts (2,035 high schools) in 38 states. Visit BibleInSchools.net for more information. --Stay active in your child's education, homework, classroom, PTA, school board, etc. --Get familiar with how academic curriculum is reviewed and chosen in your state, and then e-mail your thoughts on it to your state's education board. --Get involved in local, state and national politics, and make your voice heard. The time for passivity is over. As Thomas Jefferson once said, "All tyranny needs to gain a foothold is for people of good conscience to remain silent." --Learn your state's laws on education, and understand your parental and educational rights. Then teach them to others. To quote Thomas Jefferson again, "Educate and inform the whole mass of the people. ... They are the only sure reliance for the preservation of our liberty." --Petition your representatives to support a constitutional amendment protecting the child-parent relationship from unreasonable government intrusion. --Consider petitioning your state's education board, school district and local school to adopt the National Council on Bible Curriculum in Public Schools' curriculum about the influence of the Bible in history, civilization, law, literature and the founding of America. My personal warning to educational tyranny and tyrants is this: It's best not to test or mess with Texas. If you thought we fought hard for the Alamo, wait until you see what we can do for the right to educate our children. You can hide behind your No. 2 pencils, but our branding irons will find your tail sides.